You are here: Home / Flora / Grow Succulents and Bromeliads on Hypertufa! Hypertufa is a manufactured stone using peat moss, perlite, and Portland cement. It’s very porous, lightweight and excellent for potting plants. It can be made into any shape including pots, faux stones, garden ornaments and anything your mind can think of creating! In the hypertufa stones we used, there is a small indentation created to nestle the plant into, just large enough for a little bit of cactus mix and the roots. Cacus mix is a combination of sphagnum peat moss, composted plant products, sand and perlite. There are many recipes and they can get super technical. We don’t overthink it. Once, we simply mixed 50/50 sand and potting soil in a clay pot and that was it, but the cactus loved it and bloomed! It was a grafted cactus and they are “not supposed to bloom” …but look what happened. 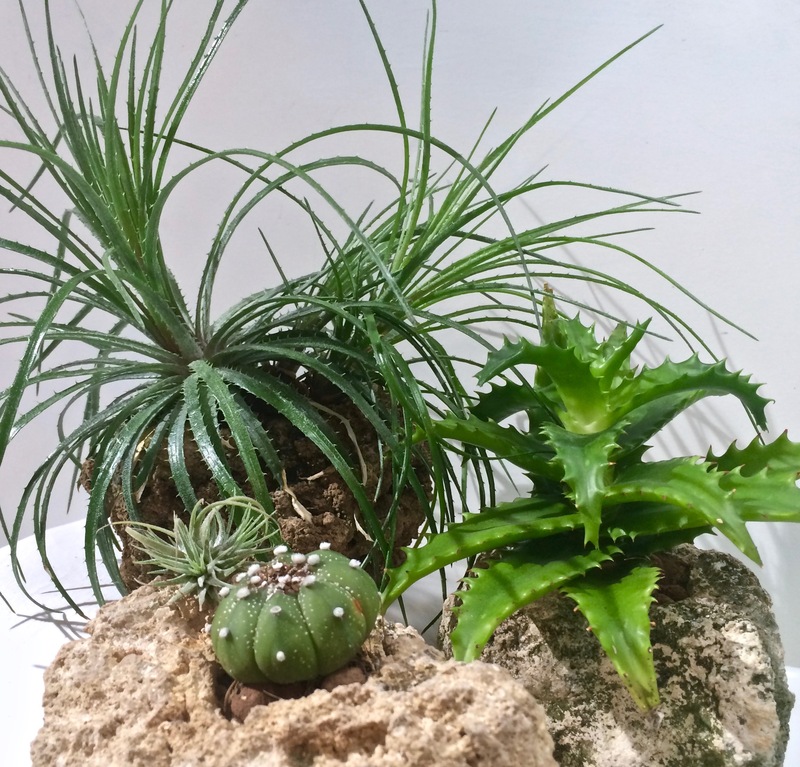 Dyckia: a member of the bromeliad family with very stiff thorny leaves (back left). Aloe: a member of the succulent family, shown below is a hybrid version (back right). Astrophytum Asterias: a species of cactus sometimes called, Sea Urchin and Star Cactus (front). Tillandsia: the baby tillandsia (air plant) is resting on the hypertufa next to the Astrophytum but isn’t attached, it’s literally just sitting there. 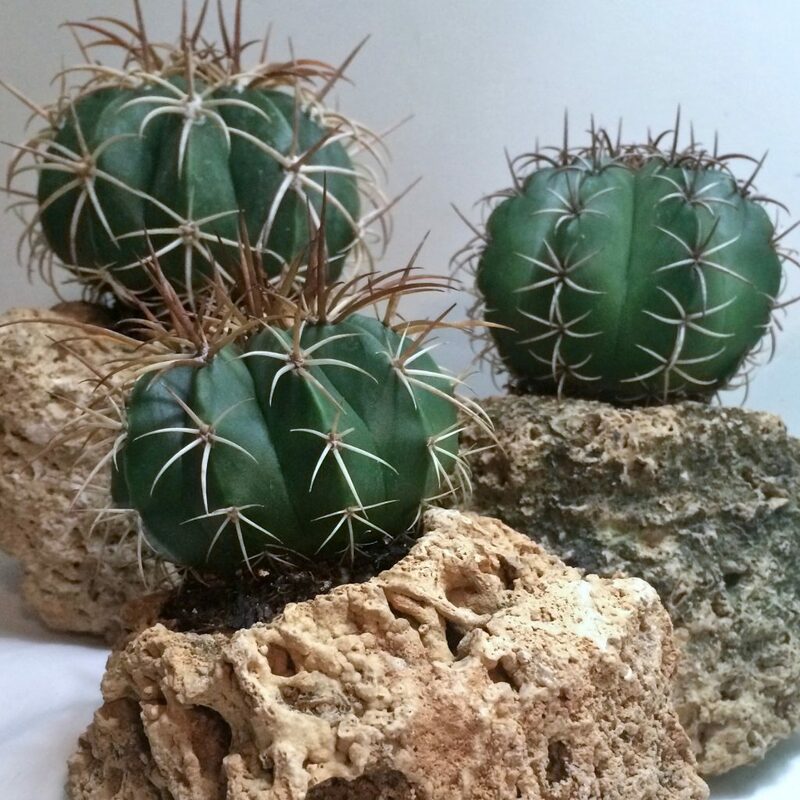 Below is an arrangement of Melocactus on the hypertufa. Melocactus are also called Turk’s Cap Cactus because of the weird bloom it eventually gets… Again, a spoonful or so of cactus mix around the root and it should do fine. All these plants have been on the hypertufa for about 1 1/2 to 2 years and doing very well! We’ve kept them on our kitchen windowsill, west facing. We water them about once per week in the kitchen sink with tap water. We welcome any questions you may have, so ask away in the comment section, thanks! Subscribe to our posts in the top right corner of this page. Beautiful post. Nature at its best. Ideas galore.